Before we left for Arizona I wanted one more picture of Ellie at the dog park at Irving Park, the first stop on all our walks, and this lovely spring morning gave me the perfect opportunity with the trees blooming behind her. Ellie had many dog admirers, a handful who absolutely adored her, fortunately I had a chance to talk with all of their owners before we left so they wouldn’t assume the worst when our elderly pup suddenly stopped showing up at the park. 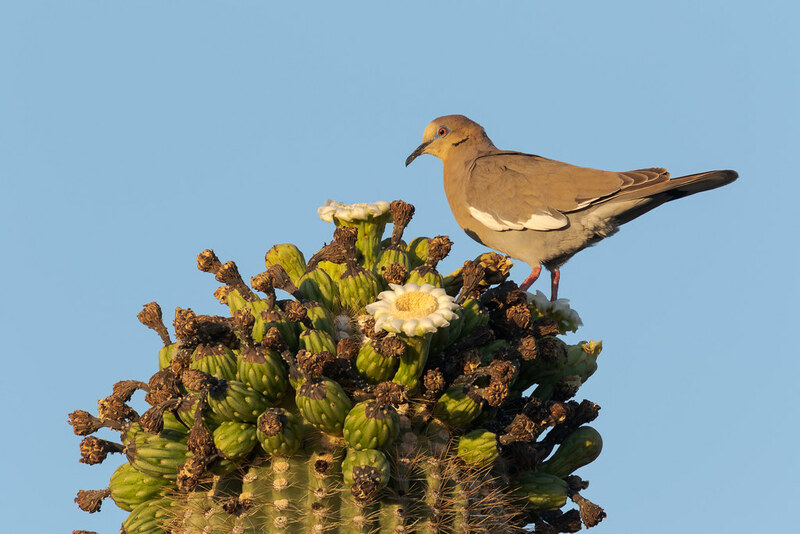 In case you were wondering what a white-winged dove looks like when it isn’t plunged headlong into a saguaro blossom, here you can see most of the bird apart from its feet. 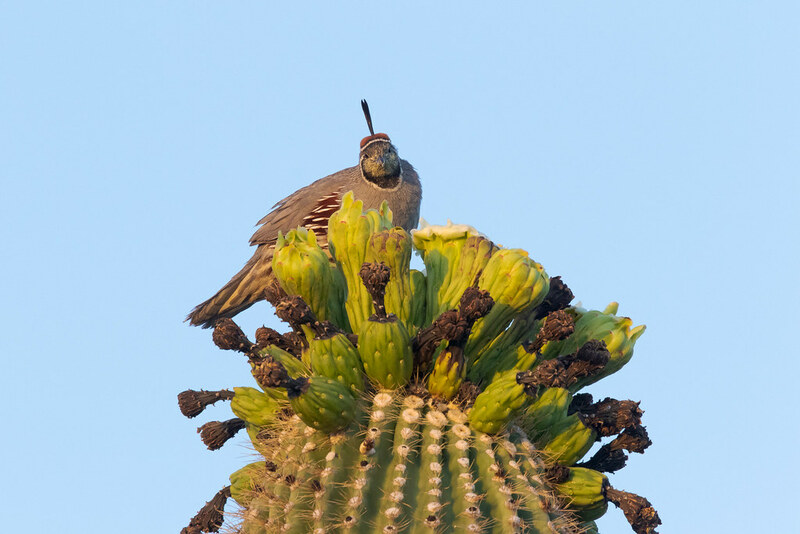 The golden color to the entire front of its head is from pollen, making readily apparent how the birds pollinate the saguaros as they stick their heads in the flowers from one cactus to the next. Much to my delight white-wings are one of the most common birds in our backyard so I get to see them every day of the week. 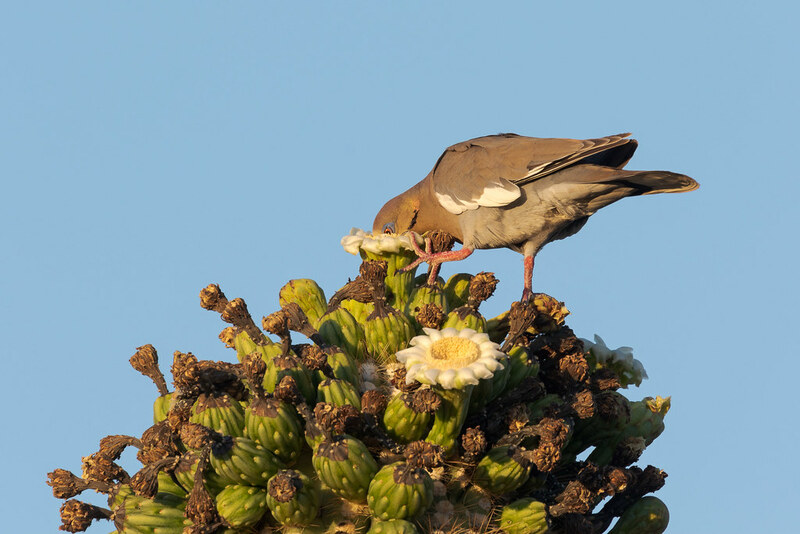 A white-winged dove sticks its entire face into a saguaro blossom as it feeds. It’s face was covered in pollen, as were many of the birds in my pictures from this time, such as the Gambel’s quail below. The birds and bats and bees took full advantage of the suddenly plentiful blooms, dining quickly as they flew from one flower to the next, pollination in action. The blooms are mostly gone now, this morning I saw only two flowers during several hours of hiking, and one of those was pretty wilted.